– Get an alarm system & USE IT. STICKER all 1st floor windows & doors as well as place an alarm sign in a visible location. This absolutely makes criminals do a double take. Worst case, it’s a discount on your home owners insurance. 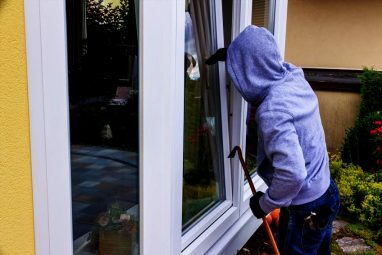 An ACTIVATED alarm system will also give you time to respond if someone breaks in. These few seconds could mean life or death in a break in. – Pin up the “red” pull release handle on your automatic garage door track. This is an easy entrance for any bad guy. They will typically use a hanger to pull the red release & viola, your door is now manually free to enter. – Home manicuring.. Cut/ Trim front bushes from front windows. – Use dowels on all windows & sliders. (Most sliders can be opened by pressing, and sliding the door. Dowels stop this. Replace standard screws with longer screws in door lock brackets. This deters kick- ins. I also recommend barn door locks at the top of your entrance doors. Cheap but effective. – Get a “Ring” Video Door Bell. It’s a cheap, & effective way to monitor your front door. Provides two way intercom, motion activated video, & cloud hosting. – See something, say something. Notice someone cruising slowly outside, take note & report it. Worst case, it’s nothing. Best case, PD has a description of a perp. Most cases, you’ll never need any of this, but again it’s about preventative mindsets, not reactionary mindsets. MyFolsom adds; Make sure your home’s exterior is well-lit. Criminals don’t like to work in the spotlight. Roger Gaylord is a Councilman with the City of Folsom, and a professional Security Consultant.